This is a novel I probably would not have read had it not made it onto the Independent Foreign Fiction Prize shortlist. There’s something about that single name that says both quirky and indulgent (Prince? Bidisha? (again, never actually read her due to my single name prejudice) Bjork?). Speaking of Bjork, Sjon also writes song lyrics and has worked with her in the past – they’re both Icelandic – another anti-recommendation in my view. At this point I’d love to say either: a) I was so right – it’s terrible; or b) I was so wrong – it’s amazing. Unfortunately, life is never that straightforward (just ask Jonas Palmason, the novel’s protagonist) and both convictions were predominant at different points in my reading – in fact, it’s a while since I read a book that left me so undecided. However, this period of happiness soon ends when Jonas returns to Iceland to clear his name with a letter from the Danish King only to be exiled to his island once again. One of my difficulties with the novel was that I couldn’t always divine Sjon’s intentions. He presents an intriguing picture of a man who is clearly both intelligent and curious trapped in a society that is mired in superstition and religion. However, Jonas himself is deeply religious, and not without his irrational beliefs – one of his proudest achievements is ridding a community of a ‘walking corpse’. This makes him all the more convincing, but harder to identify with. Few of the other characters make any impression – we are very much within Jonas’s mind for much of the novel. Even his monologues are addressed to fellow creatures rather than fellow humans. What saves the novel for me are passages of astounding lyricism and imagination. The first few pages, which present to us the creation of man from the point of view of Lucifer, are stunning. (The bleak tone of this Prelude, where man is presented as cruel and savage, is a recurring theme, never more evident than when a group of Basque sailors, hunting whales of the coast of Iceland, are slaughtered without mercy.) Every time I felt Jonas’s meandering thoughts were becoming a little tedious, the next page would suddenly make me sit up and take note with a striking image or tale. 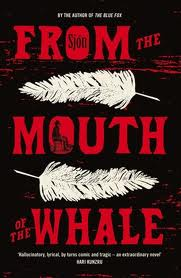 For that reason, though I can’t whole-heartedly endorse From the Mouth of the Whale, I am sure that many readers will love it, and it is likely to make an impression on all. 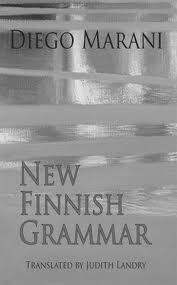 I first read New Finnish Grammar last year on the back of an enthusiastic review from Nicholas Lezard in The Guardian who described it as “something special”. I was, however, underwhelmed. This is not to say I regarded it as a poor novel or undeserving of praise, but I simply didn’t feel it stood out among the other novels I was reading (admittedly, I was spending the year reading experimental fiction). Now that it has reached the shortlist of the Independent Foreign Fiction Prize (as well as being a finalist for the Best Translated Book Award) I thought it was only fair to try again, knowing that the fault was as likely to be mine as the book’s. The novel begins with an introduction by an ex-patriot Finnish doctor, Petri Friari, who has compiled and edited the manuscript which follows, but is also an important character, the catalyst for the story we are about to hear, “having set the author of these pages on a mistaken course, thus wreaking his destruction.” The doctor’s complex relationship with his homeland (his father was executed during civil war and he now lives in exile in Germany) is at least partly responsible for his conviction that the unconscious man who is brought to him and wakes with no memory is Finnish, the only clues to his identity being the name Sampo Karlajainen written on a label on his jacket and a handkerchief with the matching initials S.K. When Koskjela leaves to fight the Russians, Karlajainen is entirely alone. When he discovers the truth about who he is, he is filled with despair and the novel heads towards the tragic conclusion intimated in the introduction. New Finnish Grammar, then, has both an interesting set-up and an intelligent presentation. It pursues its themes of identity, nationality and language with some subtlety using its wartime setting and its small cast of characters. It suffers a little from the blandness of the prose which leaves each of the narrators sounding the same. Perhaps that’s why I found Karlajainen’s predicament unengaging for much of the novel, and was ultimately left rather cold by the ending. It is clear, however, that Marani is an interesting writer and there is enough here to make me look forward The Last of the Vostyachs, published next month, and perhaps even his Europanto work, Las Adventures Des Inspector Cabillot, which follows. As usual, my random reading of the long list has left me with half the shortlist still to read. New Finnish Grammar must remain something of a favourite having been chosen as a finalist for the Best Translated Book Award as well. Eco would seem an unlikely winner as the Prize has tended to go to less well known authors. Similarly, Dream of Ding Village has perhaps had too much publicity. I’ll try to read the rest of the short list before the winner is announced on the 14th May. 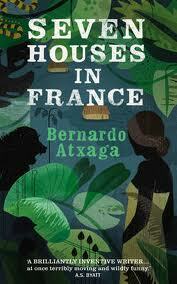 Seven Houses in France is something of a departure for Bernardo Atxaga as it is not set, like his previous novels available in English, in his native Basque Country. Nor is it set in France, the titular seven houses being an ambition of the wife of Captain Lalande Biran, a Belgian soldier who has spent the last seven years in the Congo trying to obtain the wherewithal to allow her dream to come true through the smuggling of ivory and mahogany. The year is 1903 and Belgium is a colonial power, but though you might expect Atxaga to be interested in the mechanics of colonialism, this is, in fact, a story of individuals and the setting a means of creating the claustrophobia necessary for it to be enacted in all its intensity. When a journalist, Lassalle, arrives from Belgium to cover the erection of a statue of the Virgin Mary in a remote part of the Congo, he narrates his thoughts as newspaper articles. Religion is to the fore and Chrysostome’s fear of women is the result of the sight when a child of a man suffering from syphilis, encouraged by the local priest. The blue ribbon of his medal of Our Lady is always visible. His faith is echoed by the camp cook, Livo, who, when things begin to go wrong, seeks the advice of a local wise woman. It might even be said that Biran’s faith lies in his wife. All beliefs, however, lead towards death, though Atxaga’s comic undermining of his characters makes it seem less than a tragedy. 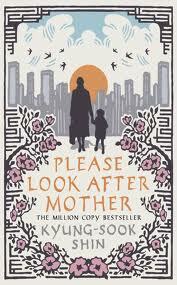 Kyung-Sook Shin won the Man Asian Prize with Please Look After Mother, her sixth novel and the first to be translated into English. It was also a huge commercial success in her native South Korea. The conceit is a fairly simple one, though beautifully executed: on the way to visit her children in Seoul, So-nyo, is separated from her husband when he boards a crowded train and she does not. The story of the subsequent search for her is told from the shifting perspectives of family members as they re-evaluate their understanding of their mother now that she is missing. In the final section Shin gives us So-nyo’s own voice, in a way that may not please all readers, but which allows narrative closure and provides the necessary completion of her portrait. It would have been ironic if, in a novel about a woman who is ignored, the reader also did not hear her. Though it may seem sentimental in summary, and it certainly has a mass appeal that makes it easy to see why the novel has been a best-seller, I found it genuinely moving. It charts that journey from childhood, when we feel we know our parents completely, through our own development into adults, when we often, like So-nyo’s children, give them little thought, to the often belated realisation that there may be areas of their life, external and internal, we are completely ignorant of. 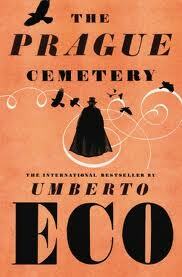 Umberto Eco’s fiction has always showed a fascination with stories. In his previous novel, the disappointing The Mysterious Flame of Queen Loana, an elderly bookseller immerses himself in memories of the stories of his youth; in what remains his most famous novel, The Name of the Rose the mystery is centred on a library. In The Prague Cemetery the stories may not literally poison, but nonetheless they are designed to infect minds. In it, Eco turns his historical gaze on the rise of modern anti-Semitism by shining a light on the dark art of propaganda. Our central character is a secret agent and propagandist who is so uncertain of the truth he does not even know himself. He is also unaware of the damage he has caused over his long career, regarding himself as a man that rarely kills, yet unable to explain the corpses he has hidden beneath his house. The novel, then, is his attempt to regain his present by retelling his past. Whether the document is true or false is never the issue –when Simonini initially pretends to be angered at the suggestion it may be a forgery, Bianco tells him, “Even if this document is all your own handiwork, it suits me and my superiors to present it to the government as genuine.” It is this same document, reappearing in different forms to suit different audiences throughout the novel, which leads to the famous forgery The Protocols of the Elders of Zion. (It will also not surprise you to learn that Simonini is also involved in framing Dreyfus). For a novel with such an unpleasant central character, The Prague Cemetery is generally very readable, with a fast-moving plot which can be (as Eco himself admits) a little confusing. As with his previous novel, it is illustrated throughout, with the many prints giving the impression of something fabricated, like the many forgeries Simonini creates, from existing sources. Eco has often celebrated the power of stories, but here he shows their danger: though the novel ends before the 19th century, it is the 20th century that is most in our minds. He speculates that perhaps the fact that the murder is irreversible and therefore any phone call could only lead to the arrest of the murderer, but not save the victim, has caused him to hesitate, but when he goes to discuss it with a friend he finds he cannot bring the subject up. The novel becomes not so much about Andersen deliberating whether to contact the police or not, but attempting to understand why he did not do so immediately. That Andersen can find no mention of the murder (or missing women) in the newspapers adds to the sense of unreality. 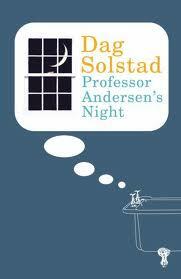 Professor Andersen’s Night is not a book you would choose to cheer yourself up, but nor is it unremittingly bleak. Andersen’s relationship with his students is one cause for optimism. It is also not a novel that provides easy conclusions; instead it is one which provokes uncomfortable thoughts, as the best literature always does. You are currently browsing the 1streading's Blog blog archives for April, 2012.